I thought it would be easier...some of these books I haven't read for years, and even if I recall that I enjoyed them, which I don't always do, I have problems letting go. Meanwhile, in the office, the mystery collection is almost gone and I'm working on sf/f. I'm up to E but the Eddings books will not be going away. For a long time I read his first series at least once a year (though I didn't care too much for the princess-heroine). Lin Carter was boxed up yesterday for a friend of mine who sells sf/f books and/or the DASFA (Denver Area Science Fiction Association) raffle table. I moved my collection of tarot books and cards and general oracles (the pendulum stuff I bought for Heart Fate, about 6 Celtic decks, two of which aren't available any more). I've made a shelf for my author reading copies--when I find all of them. and have finally made the best decision. So much for rambling on a hot summer's morning. See you soon, enjoy your day. I'll be heading out in a bit for new critique group. Some crit buddies and I are doing a panel on plotting at the RMFW conference, and we will be including a couple of 5 minute exercises. Beginning, Middle, End. I don't do the middle because I am speaking about the middle while others are writing. Anyway we will be getting something from the audience (character and trait) before we start. I'm plenty nervous, and not sure I can do it...though we did practice. I tried to pass him by. I didn't want him in my cab, Miss Bee-yu-tee-ful. He was in green camoflage and had a bunch of those little ribbon bars -- you know the sort, the ones that announce you've shot more people than anyone else. He was standing on the curb outside of the Brown Palace and swear-to-God he stepped out in front of my ride. So I had to stop. And I didn't want to, 'cuz you know however much that camo was supposed to flage, I still saw the cigar ashes all over his shirt. But I braked and he looked through the top crack of my a/c'd window and said, "Take me to Mars." May all your exercises go well. Yes, I updated several pages (but not all), of my website. Advanced Readers Copy of Enchanted No More. Enjoy your day, may you stay cool or warm as the case may be. I picked up THE Daphne today. Apparently *I* (and others who have won Best Overall) can say that. 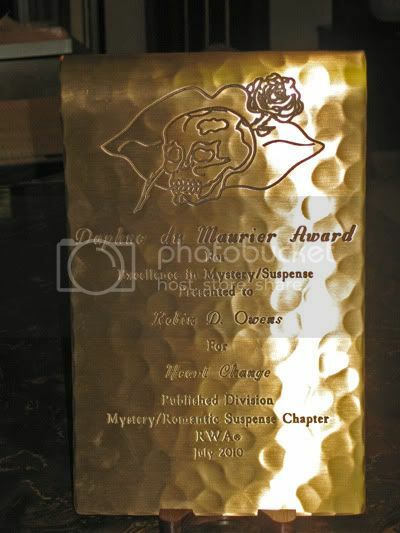 People who have won the categories (which I also did), have to say something like The Daphne for Paranormal/Fantasy/Time Travel/Futuristic Mystery/Suspense CATEGORY. This is all in the contract between the RWA(r) Kiss of Death Chapter and the Daphne Du Maurier estate. I'm THRILLED that Heart Change will be going to the estate/library, too! WOW! That really impresses me. I also get to put Winner of The Daphne Du Maurier Award of Excellence on my book covers. The photos are not good. Though Mom's kitchen/dining room was relatively bright, the camera insisted on flashing. I still haven't mastered all the settings (all of which seemed to be on when I got it back from the repair guy, Bless him). 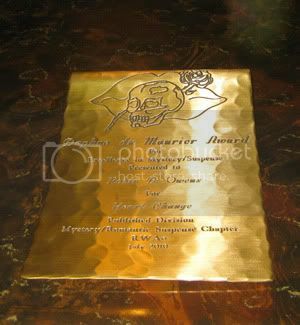 Anyway, it's a top "scrolled" hammered brass/bronze. I LUVS it! Lips in the background, then rose, with a nice skull (with an area that appears to be "missing" as if an object had hit and kilt the poor human). May you have many smiles, too. Once I turn in the book, I rarely read it again, especially for pleasure (occasionally I'll look at Protector of the Flight), but the last two weeks I've reread Enchanted No More (after three months) and Heart Fate (after about 2 years). And I've found I like both books, a real bonus! So I am pleased with myself. May you enjoy whatever world you're in today. I recently got my copy edits for Enchanted No More (and they are turned in!). These were the first full-on electronic edits from Luna, though I've been struggling with them for two books from Berkley. I still loathe word and the comments field, and apparently Luna is working in a different version of Word than Berkley. Also, contests are usually computerized now, so I've been doing a lot of editing on the computer when I judge. This is good for clarity (otherwise I end up with arrows everywhere), and as a different way of looking at my work. BUT, there was a page where I knew something was wrong and couldn't quite figure it out, no matter how I stared at the screen. So I printed it out, took up the pen, and fixed it in under five minutes. Mixing the media can be the message, can bring insights that only one won't do. May you be all you can today. Today the copy edits for Enchanted No More are due. They went fairly well until page 140 (of 186). Then editor began having problems with my end-of-chapter hooks -- you know trying to keep a reader turning the next page to see what happens -- and, a couple of places, some motivation. I fixed all, I hope, but I am iffy about the flow of one page, so I'll be looking at it this am as soon as I finish this. Heart Fate mass market paperback is coming December! I got a .pdf to look at for the page proofs, so I started reading that last night. Supposed to be looking for typos, etc. and though I have been tempted, I haven't done much editing. It's really not fair to change between the trade edition and the mass market, I don't think. So I've been hopping from world to world, which I try not to do. I have some promo going on for Heart Journey, this week. A Spotlight went up on moi here: . There will be a chat at Coffee Time Romance all Wednesday and a chat Sat pm on Melodee Aaron's yahoo group. May you enjoy your day and work pass well and quickly and interestingly! JUST back from the workshop, which was excellent for spending time with my writing buddies and their brainstorming, not so good for Heart Search. I'll be working on changing Laev's motivation (so he is stronger), and Camellia's suppression of the fact she knows he's her HeartMate. The cat's are fine, though Mystery Merlin did, of course, manage to remove the new red collar I bought him on Tues. No where to be found. We offer a weekend poll at The Long and the Short of It romance reviews-- we want to know which book or story sounds like the best read based on our reviews. The winning author gets a nifty button and the privilege of having their book or story featured at the top of that page the entire next week! Your story "­­­­­­­­­­­­­­­­­­­­­­­­­­­­­­­­­Heart Change" was reviewed by us this week and is up for Book of the Week honor this weekend (voting runs from Saturday, August 14th through Sunday August 15th). We thought you might like to know. This is nice, and it's a good review, YAY! May your day be full of interesting and pleasing things. Late Tuesday p.m. (after working hours in NY), my desk phone rings. It is my Luna editor. Me: Oh, you're calling about the 2nd Luna proposal (the due date for acceptance is within a couple of days). Ed: No, I'm calling to see how you're doing on the copy edits of Enchanted No More due tomorrow. Me, after hyperventilating and clutching chest: I didn't get them! The conversation went on from there, I believe my email box wasn't big enough for it or it wasn't forwarded on. In any event, they are due Monday and we won't be in too bad of shape if I get them in at that time. So I may be least-in-sight for a few days. May you have no scary surprises today. ABOVE PIC, Upper Bear Creek Canyon, from last year's research trip for Verde Valley in Heart Journey. I've actually been working on a wedding in the family, and really working on a deep critique. 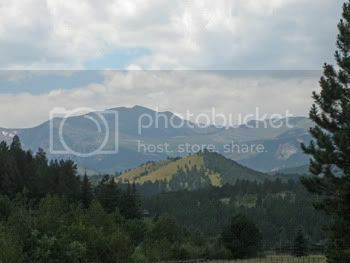 Tomorrow I go away with friends to the mountains for an intensive plotting and/or critique session. I think I need critique more on Heart Search, so I'll be taking that. We have wi-fi there (and I have the camera back), so I might have more pictures to post of scenery (which I may or may not use in books). May you enjoy all that's going on around you. 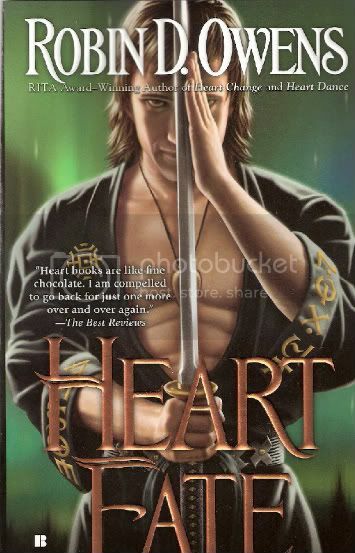 Here's the new mass market paperback cover for Heart Fate, you can see that they moved the lettering so the guy's whole face is revealed (I'm not sure I want to call him Tinne, since he doesn't look much like, um 22?, to me...even though I've been emotionally torturing him for years). I got the page proofs for Heart Fate yesterday -- a complete surprise -- and just stared at them for a while. That book is at least 3 and maybe 4 books past for me. I don't intend to do any rewriting at all, but if I run across an awkwardly worded sentence or the use of the same word three paragraphs running, I will fix. May you enjoy contemplating your past. And Heart Journey is OUT! Yes, it's been shipping early, but the official release date was Yesterday. May you be jazzed (and Raz - ed) today.